Browsers are probably the single most often used application we use in our computers and hand held devices. Internet Explorer from Microsoft, Apples’ Safari, Google’s Chrome and Mozilla’s Firefox have been the mainstay for a long time. We reviewed browsers a long time ago here . Then we reviewed the then new Edge Browser in 2016 here. We have been using Firefox for most of our work despite its inherent limitations – its propensity to crash when multiple windows were opened and its outrageous use of memory. We found that in its portable avatar, it was easy to move the work from one machine to another without breaking into a sweat. When they introduced a completely revamped version – Firefox Quantum, a couple of days ago, we had to take the plunge. Firefox Quantum has really come a long way from the earlier version – at the first glance. It loaded pages faster and gave a smaller memory footprint. Nearly 33 % of users have 4 GB in their computers, 22 % of users have 8 GB, according to the statistics culled from Mozilla’s hardware metrics here. The above statistics confirmed our suspicion that the vast majority of users haven’t drastically upgraded their memory. 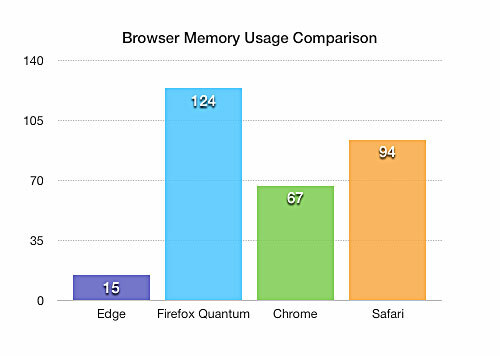 This implies that browsers need to reduce the usage of memory for a better user experience. This is all the more important as many sites tend to open additional resources in a new tab/window – thus increasing the overall memory consumption. Anecdotal evidences are not enough to judge what makes a Browser fast or how much memory it occupied. 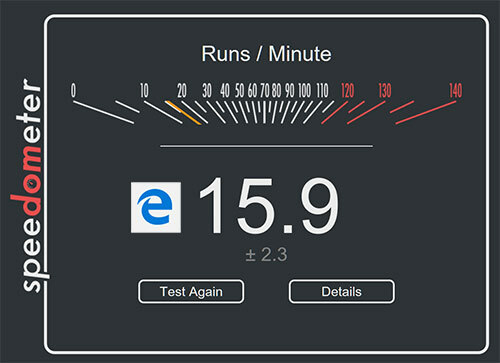 We needed some sort of reliable benchmarking system to compare the browsers we want to test. 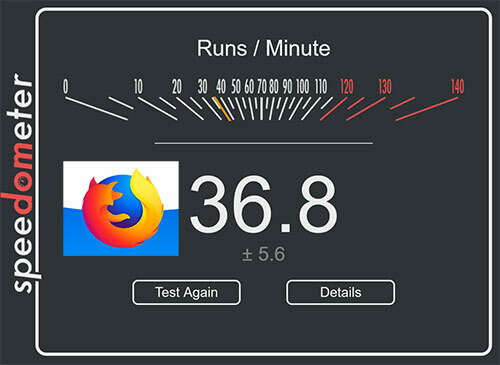 So we used the browserbench.org to benchmark the browsers. 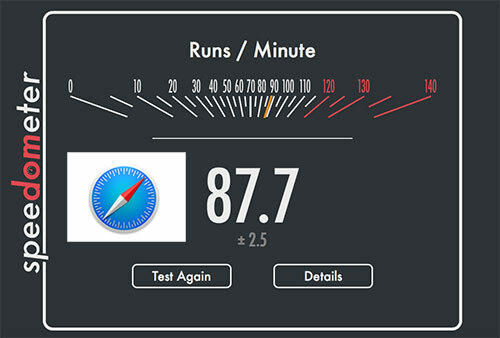 We used Speedometer which measures the responsiveness of web applications. When the tests were running, we also noted down their memory usage and prepared the charts as shown here. You will find that Edge browser has the edge over other browsers here when it comes to having the lowest memory foot print – it just took 15 MB. 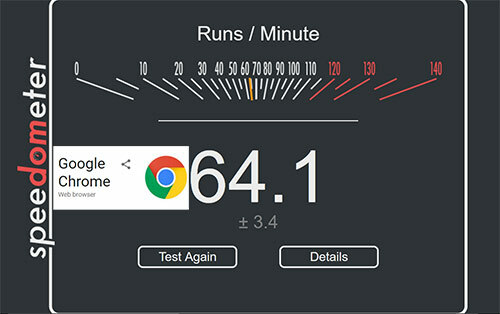 Chrome continues to impress us as it came next with 67 MB of memory and despite its low usage of memory, Chrome performed better in terms of speed, only second to Safari browser in this line up. The new Firefox Quantum slurped the highest in this line up – 124 MB – still a lot lower than the earlier version 55.0.3 which gulps down a massive 724 MB. Apple’s Safari browser which comes with the High Sierra performed the best in this lot – 88. 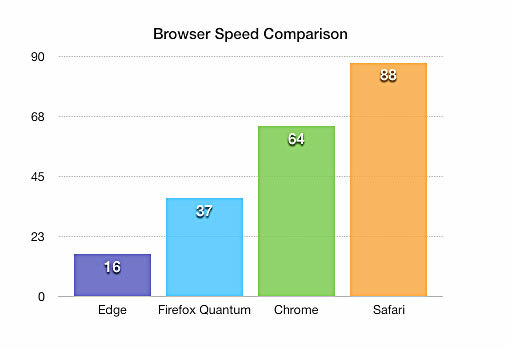 For actual real life usage, Safari outperformed every other browser. We find the FF Quantum and Chrome fast and stable with at least 10 windows open – something we couldn’t even try in the FF version 55.0. It is interesting to see that things haven’t much changed in terms of memory usage from the time we reviewed the browsers about 9 years ago.